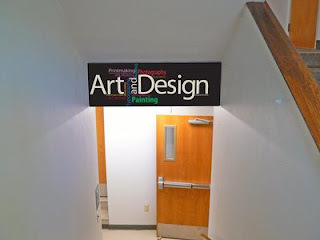 ...Elizabeth Daugherty's design - for the entrance to the Art and Design Department, was chosen from a wide array of entries submitted by all students in Brother Roderick's graphic design courses this spring. The actual sign will be manufactured and installed by Big Guy Design in Winona, owned by Rich Hultman, SMU art and design alum. Elizabeth is on a roll of sorts, having her cover design chosen for the spring Typography class project. Congratulations to Elizabeth, and thanks to all who entered!